Many people report a feeling of general well being when they take their daily multivitamins regularly. The individual vitamins and nutrients in a quality daily multivitamin delivers to you their specific benefits of each individual vitamin, plus you get the combined, synergistic benefits and effects of all of the ingredients working together. To scientists, researchers, and health conscious people, the benefits from supplements has never been in doubt. Plus we cook our food and that can kill certain nutrients, and the time from farm to table is often weeks, and much of the nutritional value is lost. Plants get their minerals from the soil, and it is so depleted that it is all but devoid of essential minerals such as selenium and zinc. Process foods are so lacking in nutrition, and make up so much of the American diet. 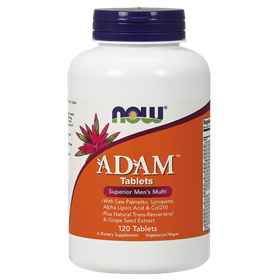 Taking a good quality multi-vitamin & mineral supplement like NOW Adam Multi-Vitamin, can really bridge the gap in nutritional deficiencies. Suggested Use: As a dietary supplement, take 2 tablets daily, preferably with meals. Other Ingredients: Cellulose, Maltodextrin, Stearic Acid (vegetable soruce), Croscarmellose Sodium, Silic and Magnesium Stearate (vegetable source). Vegetarian Formula. Contains no: sugar, salt, yeast, wheat, gluten, milk, egg or preservatives.